"Never judge a book by its cover" goes the saying - and it's equally true of DVDs. The UK release of Ben Wheatley's Brighton set debut feature 'Down Terrace' has a ghastly front cover: an old geezer in a sharp suit looking like he wants to nut you, with the film's title styled as a Union Jack. There is an obligatory "best British gangster film in years" quote from BBC Radio Five and the dreadful, hooligan-bating tagline "it's about to kick off". Yet, as you might infer from the way I began this review, this is not a fair representation of the sort of film 'Down Terrace' is: a smart, well observed and subtle family drama with a dash of crime to up the ante. 'Down Terrace' is, at its core, the story of a tired minor crime boss, Bill, and his browbeaten, manchild son Karl - played to great effect by real-life father and son Robert and Robin Hill - a bickering, hate-filled pair who resemble a modern take on 'Steptoe and Son'. 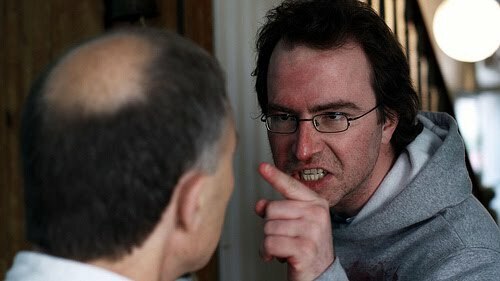 Karl has recently been released from prison to find that his girlfriend (Kerry Peacock) is pregnant, to the disgust of his father and the family's worn down matriarch Maggie (Julia Deakin). A crime plot, involving a series of murders, misunderstandings and a few twists, gets underway as Bill and Karl come to suspect a rat in their midst, but this is really about the twisted, abusive relationship between Karl and his parents. If you have to liken it to another gangster movie, it belongs in the company of moody Australian ensemble drama 'Animal Kingdom' rather than 'Lock, Stock', for many reasons (some of which come with spoilers attached). Though, with its naturalistic performances and dry wit, 'Down Terrace' is a closer cousin to Mike Leigh than anything else. It's a low-key British kind of humour that wins the day, preoccupied with mundane concerns and peppered with gentle stray observations. For instance, at the height of the drama Bill tells Karl that - were it not for the recent murders - he could have finished painting the breakfast room by now. One pivotal blackly comic scene sees the 35 year old son screaming "mum!" at the top of his voice because he can't find something in his cluttered bedroom. Despite the Brighton setting, Wheatley resists indulging in the now cliche iconography of the city, such as the Pavilion and Palace Pier. There is one reference to "trouble in Whitehawk" that will make natives chuckle and a scene on the Sussex Downs, but on the whole the fact that it's set in the area provides character and nuance without being tacky or fetishistic (unlike some bigger productions). The whole thing speaks of great discipline and the director makes the best of film's low production budget by focusing on the claustrophobic interior of the family home and a small group of authentic seeming actors. For those enticed to the DVD by enthusiastic pull quotes about its Brit gangster movie credentials: there are a few scenes of brutal, bloody violence and several foul-mouthed conversations about the importance of "family". But 'Down Terrace' is much more concerned with character and relationships. It's sinister, damn funny and, as it reaches its climax, even a little moving. 'Down Terrace' was released in 2010 and is now available on DVD. Ben Wheatley's new film, 'Kill List', is in cinemas from September 2nd.